I was a very lucky winner of a competition on the ubelly blog, receiving the amazing prize of a Samsung Omnia 7 smartphone featuring the new Windows Phone 7 (WP7) operating system. I received it mid-December so I have had just over a month to get used to it. This review is mainly focussing on the Omnia 7 hardware, I have reviewed the Windows Phone 7 OS in a separate review. This is my first ever smartphone after using a Nokia 6233 for 3 years so bear in mind I won’t be comparing it to any androids or iPhones. The device was a lot thinner and lighter than expected. I was a bit worried to be carrying around a brick in my pocket but I’d say it weighs les than my old Nokia which was much chunkier. The screen is absolutely beautiful. 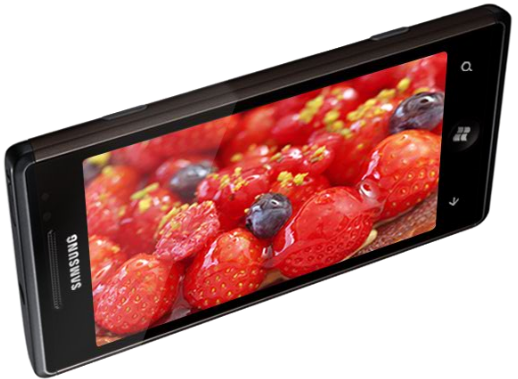 It’s a 4.0” super AMOLED screen (480x800px). It looks great in direct sunlight (not that we’ve had much this January! ), can be viewed from any angle and the colours are really vivid. It’s got all the bells and whistles you could want, due to Microsoft’s wise minimum specification. GPS, Wi-Fi, Bluetooth, FM Radio. The processor is nice and fast, I haven’t experienced any lags, and it’s also quick to start up from cold. It can be hard deciding between phones with features missing so I’m very happy that I’m not missing out. Bluetooth, Windows 7 will play any audio wirelessly through my desktop speakers. Data connections are really good on the 3 network. Speed is really quick which is great when there isn’t any free Wi-Fi around. They obviously have done a lot of work on their network, much better than it was a few years back. which is a great looking offline dictionary app that will come in handy for future games of Scrabble! I hope Samsung up the game a bit to match LG by offering free games or some of the more popular apps, as well as continue to update the existing ones with new features. Battery life. Apparently the phone is supposed to last up to 390 hours in standby and over 8 hours talk time. This is not my experience. In fact “Talk time” is a bit misleading for a smartphone, they should really just say “Active use time” as there are a lot more power-draining activities than talking (in fact the screen gets turned off when you hold it to your ear to save power). Realistically, I am plugging it in to charge every night. I might get 2 days use out of it at a push, as long as I don’t play any games/videos on it. I found disabling Bluetooth helped a lot. At least you can charge it from any USB port. The case. It has a nice curve and the screen, as mentioned above, is fantastic but it does feel like you could snap it in half. The curved shape also means it is impossible to stand it upright to watch a film or take a steady, timed, photo.I’m also not a fan of the weird metallic purple on the back cover. It is also hard to hold without accidentally pressing a button. Finally it’s very “slippy”. It fell out of my pocket numerous times and sometimes felt like it would go shooting out of my hand when I put it to my ear. Luckily, I got a very cheap custom cut silicon case from Amazon that stops it slipping anywhere as well as making the buttons less sensitive. The Omnia 7 has a mix of physical buttons around the edge and touch buttons along the bottom of the screen. The touch buttons are unbearably sensitive. The amount of times I’ve started a Bing search mid-way through a game or pressed back when browsing a website make me scream in anger. Thankfully at least the “Home” button is nicely recessed in the glass so that one requires a more deliberate push. The physical buttons are just plain awkward. You may need to grip it to change the volume and end up knocking the power button. The camera button needs to be manoeuvred so accurately to get it to wake up from standby, autofocus then take a photo, that I have missed the “moment” on several occasions. Also, when the phone is in standby, you should be able to wake it up by pressing the “home” key or the power button but this doesn’t always work. I have pressed the home button about 5 times and nothing lights up and other times it works straight away (could be a software issue). There are hardly any accessories for it, and I feel there never will be. With the iPhone you know they will sell millions of compatible accessories because it has a gargantuan user base. The Omnia has a much smaller following which means that even Samsung aren’t that bothered about making any. The counter argument to this is that the phones connectors are standard so you should be able to hook it up to any number of compatible things so I suppose that should comfort me. It only has 8GB of storage which is a real shame. Never mind that it’s impossible to expand it, you think they would have at least used 16GB. I would have loved to put my entire music collection on it but I have to limit it to about my top 12 albums. you could argue that this isn’t geared to that kind of demographic, or that you can stream music and movies to it but to me it just seems a bit cheap. Well, that about wraps up my thoughts on the phone’s hardware. The positives definitely outweigh the negatives and let’s be honest, the real pull of the phone (apart from the screen) is it’s brand new WP7 operating system. I’m so grateful to the ubelly team for picking my fairly rubbish caption as a winner and giving me a chance to own, what I personally consider to be, a very expensive & luxurious bit of hardware. I haven’t had much luck with the camera, all the pics seem to come out blurred. I find that the camera isn’t very good at focusing on moving objects, like my kids riding their bikes. I have had problems with the button being over-sensitive but it seems a bit inconsistent so I thought it might just be a problem with my finger! This may be a stupid question but do you know you need to half press the camera button to allow it to focus before you press it all the way down to take the picture? I think it would be much better if you could just touch the screen to take a photo and it would focus wherever you touched. That’s actually quite a cool idea. Thank you for an additional brilliant blog. Where else could i fetch this kind of info written in such an incite full way? i have been looking for such detail. I got this phone, I was oh so very excited! It was fast, I loved flipping the screen up and down and some of the apps were ok, though I was disappointed at the apps you are able to download, to even search for any you have to download an app called marketplace search. Literally a week or 2 after I got it, it started messing up! I had to have it constantly on battery otherwise it would only last an hour and just turn off, half the time I wouldn’t know and grab my phone to use and it was off! I also charged it in the car, didn’t charge at all at one time. Then the top would have the battery would pop down constantly especially when the battery was dying which was ALL THE TIME. I had to turn sound off otherwise It would drive me insane with the alerts for the dying battery. These were the main problems I had, I turned it in and sent it away and they inform me a week later that it had fluid damage, I never dropped it in any sort of fluid at any point in time! Spoke to one of the guys and he was saying they are very sensitive phones and it could be humidity that damaged it or if I ever took it into the bathroom during a shower that could wreck it. So ridiculous! So I had to contact insurance which luckily I got, but it was under 3 months so I either have to pay 50 to repair it or if its not repairable 215 dollars. Just got the call yesterday, I need a new phone! Argh I literally had this Phone in my possession for 2-3 weeks. I have the option of getting the same one or a new one, I’m faced with either get the omnia 7 again and hope this one is better or go for a brand new phone? Sorry to hear about your phone, that sounds like a really bad fault. I would definitely try and get it exchanged under warranty. I know quite a few people with the omnia7 and none have had a problem like yours. I guess it would be a problem for any smartphone though. I would recommend getting another WP7 device but you might want to have a look at the HTC ones and see if they feel any more rugged. I know the Dell one has gorilla glass which is super tough. In regards to the apps it seems like there are better ones coming out everyday as the platform gathers ground. The recent amazon & Flickr ones are great. You can search the marketplace by just pressing the search button (the one that takes you to Bing normally). Let me know what you decide. I can’t get it under warranty as it is my fault because it has fluid damage which like I said is ridiculous because I have never had that issue from any previous phones before. I’m willing to give it another try though, I’m deciding between the omnia 7 again or the iphone 4. I don’t like the HTC phones, I’ve played around with them, Also If I were to get a windows phone I’d prefer wp7 and not an android phone. I am looking up reviews between the 2 and I cannot find much difference. There are pros and cons for both and I can’t afford the insurance at the moment so I’m taking the time to decide but I will in the next few weeks so if anyone has any ideas, much appreciated! I was hoping there would be someway you could prove the water damage was actually due to a fault rather than something that could have happened accidentally. If I was you I would get a really cheap PAYG dumb-phone and wait until Summer when there should be a lot more models on the market (as well as better OS software). If you can’t wait then I’d go for a WP7 device. The iPhone has had it’s day IMHO. Great Review. I’m split between this device (Omnia 7) and the dell venue pro. More about the Omnia 7, 1. Is the glass Gorrila glass? 2. How is the ear piece in call quality , many reviews are mentioning the volume being low. 3. By slippery are saying the metal is slippery? 1, It isn’t Gorilla glass. Some people recommend screen protectors but I haven’t bothered. I’ll probably regret that when it inevitably gets keyed! The Dell Venue Pro did catch my eye. I’d like to have a good play with one to see if the physical keypad provides a better experience or not. Let me know which way you go. It’s me again! Just letting you know I got the Omnia 7 again, forked out 215 dollars for it… ugh! I’m happy to have my phone back and not some silly loan phone, I have one peev though! I cannot upload videos to youtube or facebook and the bluetooth doesn’t connect with my computer or most other phones for that matter! What is the point of having video if I cannot share it with the world? Video uploading is an odd thing to not include IMHO but maybe something we’ll see in the future (though I haven’t heard anything). Normally you would send the video to Youtube via an email attachment but it seems you can’t do that either in WP7! Bluetooth improvements are meant to be forthcoming, however, I wish you could do a bluetooth sync to a computer instead of using a cable. That worked fine on my old Nokia. Updates seem to be coming very slowly, I think it will be Christmas before we get a decent update. I don’t get it why this phone is so great in some ways but so limited in the simplest of ways. I almost regret getting the same phone but then I also feel confident as there really wasn’t many other phones that were as good or better or that I even liked. I have my phone auto-sync via the zune client on my laptop. So whenever I plug it in via USB it will copy the videos to my PC. I can then upload them via the usual ways. Just a warning. I purchased this phone for my wife in November 2010, and last week the USB port stopped charging (I figured dry solder joint or something). So I returned it to Samsung only to have it returned to me stating “Warrantee voided due to PCB damage next to USB port”. In other words, Samsung clearly think my wife pushed the port too hard when plugging in the USB power supply and this has ‘invalidated’ our warrantee. I shame – the phone works perfectly apart from the USB port not charging it….and even it I purchased an external battery charger I still wouldn’t be able to Zune sync or upgrade the firmware to NODO. Just wanted to get the message out because as you can imagine I am not happy and think Samsung are dreading on thin ice. I have never been treated this way by a company like Dell, etc. That’s bad news, it seems like USB charging ports are a weak spot of a lot of phones. I had the same problem with my Sat-Nav, the USB port inside broke and they wouldn’t replace it, quoting that it had been used incorrectly. Did you ask them how much it would cost to repair? I have to say, when my phone had a busted memory module the local service centre were very helpful, it did take a month for them to fix it but that was out of their control. Did you send the phone away or deliver it in person? Might be a good idea to take it in personally so you can convince them it is their fault. Good luck!